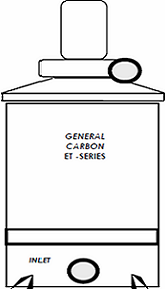 Activated Carbon Filtration | ET-Series | General Carbon Corp.
General Carbon’s ET – Odor Control Systems offer a complete activated carbon solution to your low flow odor problems and air treatment applications. The vessel is constructed of polyethylene for corrosion and weather resistance as well as durability. All tank connections are welded to the tank and the top is removable for easy carbon servicing. The industrial quality fan is mounted on the top cover of the adsorber and pulls the air through the media bed. This configuration ensures that only “clean” air will contact the fan. Motors for your electrical requirements are available. Available Options: Complete selection of NEMA rated motors accessories. Bed ground rod, Magnehelic gauge, sample ports, alarm and warning devices. FRP equipment skid, exhaust stack and rain hood. *The amount of GC IPH impregnated carbon needed to fill each adsorber is 25% greater than the listed amount of standard activated carbon.